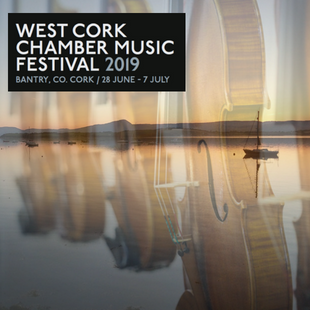 The 12th West Cork Chamber Music Young Composers’ Competition is delighted to announce it is now open for entries for it’s String Quartet Composition Competition. They welcome submissions from all Irish and Irish-resident composers Under 35. Past judges of this competition include Donnacha Dennehy, Lera Auerbach, Brett Dean and Deirdre Gribbin. The adjudicator for the 2019 Competition will be announced in due course. Scored for string quartet (2 violins, 1 viola and 1 cello). Works requiring other instruments, pre-recorded sounds or electronics are not eligible for consideration. The competition will be judged anonymously and the international judge will select four winning scores on equal footing. 2 public performances of their work by a conservatoire quartet at the West Cork Chamber Music Festival. The second will be the official World Premiere played at the quartet’s Town Concert (a date in early July). The first performance will be at a workshop attended by all four composers and the public. The composer will have a chance to discuss their work with the international judge and the musicians. The assigned conservatoire quartets will perform the works as they are workshopped and experiment with compositional suggestions. Each composer will have an opportunity to work the performers prior to the work’s first public performance. Entrants must be under the age of 35 on 1st January 2019. Entrants must either hold Irish nationality, be born in or resident on the island of Ireland, have an Irish-national parent, be an International student at an Irish third-level institution, or have lived in Ireland for at least one year. Each entrant can submit one work only each year. We can accept submissions from previous entrants and past winners under the age limit. Any works entered in previous years cannot be resubmitted. Works that have been performed in concert before a ticket-buying public audience prior to the Festival (28 June – 7 July, 2019) are not eligible for consideration. Scores must be submitted to West Cork Music by 23:59 on Tuesday 19th March 2019. All scores must be submitted electronically. Compositions will be assessed by an adjudicator chosen by West Cork Music. West Cork Music reserves the right to change the adjudicator in extremis. This competition is adjudicated anonymously. Any indication of the composer’s name or address on the score would lead to disqualification. Winning compositions will be announced on www.westcorkmusic.ie by 24th April 2019. The four winning composers will be notified directly by email. All winning composers must submit instrumental parts by 2nd May 2019 for distribution among members of the conservatoire quartets. It is a condition of entry that composers agree to attend the workshop in Bantry on Sunday 30th June at 14.00. In the event of non-attendance, prizes will be withheld. The festival will offer 3 nights’ accommodation to facilitate the composers’ attendance. All other expenses incurred are the responsibility of the winning composers. West Cork Music reserves the right to alter dates and times of the Young Composers Forum and subsequent performances. Attachments: an anonymous pdf of the score. Please check headers, footers, etc. do not contain your name. Any text that identifies the composer could lead to disqualification. Where you found out about the competition (website name, word of mouth, email circulated etc.